This book contains seventy-one poems written originally in Bangla and their translations in English. The poets are of different ages, educational backgrounds, and occupations. But they are all alike in many ways. First, they are all Bengalis, the nation which has got a rich heritage and history that goes back upto the ancient period. Second, they are all citizens of Bangladesh, which has emerged as an independent sovereign state after a prolonged struggle of its people for their rights for language and culture, democracy and autonomy, and finally freedom. They share a common view about their land and everything closely related to its welfare and progress. The poems presented in this book are all written on one particular theme, though every text appears to have a unique identity of its own. Through these poems, the poets have expressed their profound love and respect for their leader and mentor Sheikh Hasina, who is the most popular leader and currently the Honourable Prime Minister of Bangladesh. Here we remember with deep feelings, love and respect the Father of Bengali nation, Bangabandhu Sheikh Mujibur Rahman. Under his unique leadership, breaking the shackles of subjugation, after a nine-month prolonged War of Liberation against Pakistan, Bangladesh has emerged as a sovereign and independent state on 16 December, 1971. Since its emergence as an independent country, the country has gone through much turmoil. Only three years after its independence, on 15 August 1975, Bangabandhu Sheikh Mujibur Rahman was assassinated along with most of the members of his family which was the result of a bloody coup carried out by a group of misguided army personnel that had close links with the enemies of Bangladesh both within and outside the country. Sheikh Hasina and her younger sister Sheikh Rehana survived this heinous attack because they were at that time staying in Europe. Barely two and half months after Bangabandhu’s assassination, four leading members of Bangladesh Awami League who were close associates of Bangabandhu Sheikh Mujibur Rahman, were killed inside the Dhaka Central Jail where they had been kept confined. This gruesome massacre was committed by the same gang which had killed Bangabandhu. The entire nation was grief-stricken and terrified. Having lost its top leaders, Awami League was in total disarray. The perpetrators of these inhuman crimes believed that Awami League was finished forever and that Bangladesh, though not be reunited with Pakistan, would be transformed into a second Pakistan. With this blueprint, the masterminds sank the country deep in the mud and mire of corruption, religious fundamentalism, and mismanagement. But they were absolutely mistaken. The flame of freedom once kindled in the heart of the Bengali nation could never be extinguished. Like the miraculous ancient bird Phoenix, Awami League, under the new and dynamic leadership of Sheikh Hasina, eldest daughter of Bangabandhu Sheikh Mujibur Rahman, rose from the ashes to save the nation from this disaster and destruction. The people of Bangladesh elected Sheikh Hasina and her party_Bangladesh Awami League _ for three terms (each term continues for five years) for ruling this country. Over the decades, defeating autocrats along with semi and pseudo-military and civil dictators, against unprecedented odds, Shiekh Hasina has successfully steered Bangladesh for achieving sustainable development goals. She has been working tirelessly to translate Bangabandhu’s dreams into reality. The country has now once again found a remarkable progress in every sphere of people’s life. And, all her efforts have made her immensely popular among her people. Like her father, she is endowed also with a passion for people and for peace, progress and prosperity for them as well as for the whole of humanity. Today, she has emerged as a highly distinguished global thinker for her outstanding leadership, honesty, and integrity. The people all over the globe have crowned her with the title, ‘Mother of Humanity’. This land_which Rabindranath Tagore called the Bengal of gold and which Bangabandhu Sheikh Mujibur Rahman has turned into an independent state _ is today moving forward in different spheres. Now, Bangladesh has turned into a rapidly growing country under the guidance of its leader Sheikh Hasina. And, her achievements have brought applause and recognition for her from many different great individuals, statesmen and organizations across the world. Bangladesh is a land of birds and rivers. In this land, people have got the profound passion for their language and literature, culture and heritage. Here poetry flows like a spontaneous stream that reflects the dreams and reminiscences, and emotions of the individuals. The poems presented through this book depict different poets’ thoughts and feelings about their great leader Sheikh Hasina. And, these poems disclose her delight and dejection, sorrows and happiness, vision and mission, words and work, dream and action, imagination and innovation, success and recognition, as well as her patriotism and philanthropy. In these texts, one would also find the reflection of the history and culture of this nation. Although in many frontiers Sheikh Hasina is as strong as iron, she has always been kind to the oppressed and common people of her land and those belonging to other countries. She dreams of a peaceful co-existence of all nations’ justifiable aspirations and a meaningful friendship among them. All her efforts are shaped by this particular view about her country and people and peoples belonging to other countries. That’s why we have thought 'Peace and Harmony' would be the proper title of this anthology. On the other hand, this anthology includes seventy-one poems of prominent and promising poets of Bangladesh as its other objective is to remember the year _1971 _ which is the most important period in the history of Bangladesh. Besides, we want to celebrate Sheikh Hasina’s 71st birth anniversary, which the nation has recently observed in a festive manner. 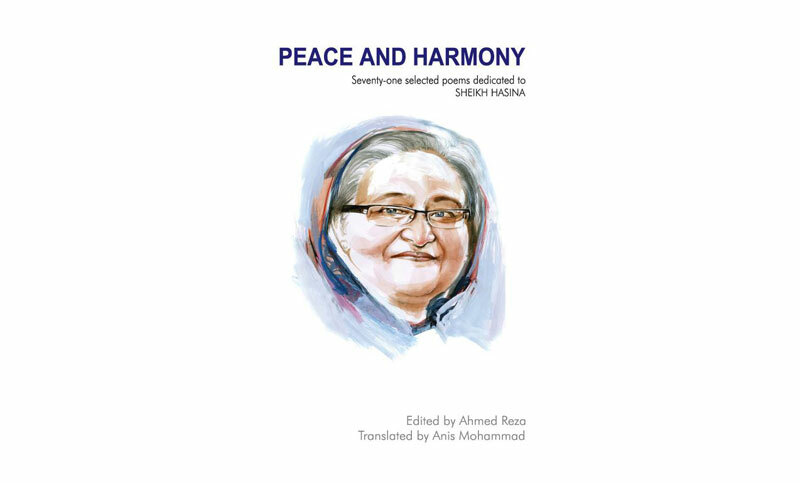 Furthermore, with a view to showing people’s deep love for their dear leader Sheikh Hasina to different nations all over the world, we have included in this anthology translations of these poems into English. We are infinitely grateful to all the poets, writers, researchers, journalists, artists, cultural activists, colleagues, and people belonging to other professions who have supported our literary effort in many different ways. This introduction is jointly written by Professor Ahmed Reza (Editor) and Anis Mohammad (Translator).